Milos Raonic was ranked No. 13 on the ATP Tour, but hardly a household name, when the announcement that he had signed a clothing sponsorship deal with New Balance in January, 2013. It wasn't Nike or adidas, the two biggest players in tennis. But it gave the rising Canadian an opportunity to carve out his own niche, where with Nike he might have gotten lost in the wake of that company's two superstar clients, Roger Federer and Rafael Nadal. It was a win for New Balance, as well, as it sought to stake out some territory in the tenniswear field needed an accessible top player to drive its campaign. Raonic was the brand's first marquee signing. They set up a great promotional stand on the road between the Southfields tube station and the All-England Club at Wimbledon last year. Reports at the time of Raonic's original deal pegged its value at $1 million US a year for five years - hardly Nadal-Federer territory, not that Raonic is, or was, in that universe, but significant all the same. Fast-forward about 2 1/2 years. Raonic's ranking is "just" five spots higher at No. 8. But in the interim, he has become an established member of the Tour's top 10, and a consistent threat to the very best who has left no stone unturned in his quest to improve and win big titles. The deal with New Balance has turned out to be win-win for both sides. And on Thursday at Queen's Club, the company announced that it has extended Raonic's deal for the balance of his playing career, and beyond. No financial terms were disclosed, but undoubtedly the stakes have risen significantly; nearly half the length of the original reported five-year deal was still valid. New Balance general manager of tennis Bruce Schilling outlined some of Raonic's contributions during the press conference. 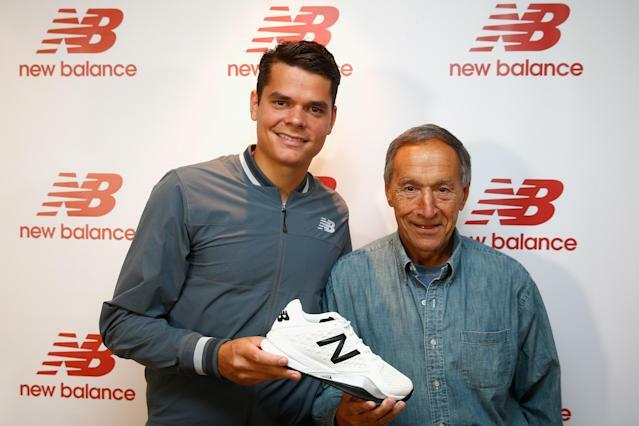 "Milos has been a great contributor to a number of teams of New Balance. He's contributed to product teams, providing feedback and insight and development of design of product. He's also worked with our training team. He's spent a lot of time with our sales team around the world and the same with our consumer group," Schilling said. Raonic said he's not just a public face. He has gotten involved. "I will tell you that I do know every single pretty much aspect of everything that goes on and how things are made, the full process. I have gone through the factory and see how they make shoes by hand there, what the whole process is. I actually got to be a part of some of the processes. I hope the person that got that shoe is happy," he said, laughing. Essentially, it's a lifetime deal. Down the line, you can picture an exclusive "Milos Raonic line" of clothing, to differentiate the brand's headliner from the rank and file. Raonic returned to action after foot surgery this week in London and is into the quarter-finals at the Aegon Championships in London, where he will face Gilles Simon of France on Friday. Wimbledon begins in 10 days; no need to speculate about what colour scheme New Balance will come up with for that all-white tournament.